I don’t recommend many movies, but today one that you really should see is coming into theaters nationwide. It’s called October Baby, and it deals in a masterful way with a difficult topic — abortion. Abortion is not and should not be an abstract debate. When I’m asked how the pro-life battle has evolved over the decades that I’ve been in leadership in the movement, I often respond that the ‘issue’ of abortion has gotten more and more of a face. This is both desirable and inevitable. The face of abortion is marked by both beauty and pain, hope and of despair, tears and the joy of knowing the Savior. The face of abortion is revealed in the photos of the babies — the primary victims — and in the faces and voices of our Silent No More Awareness Campaign, which mobilizes women and men who have lost children to abortion and speak out about their pain and forgiveness. And the face of abortion is increasingly revealed by its survivors, not only because more and more of them speak out, but also because filmmakers are using their talents to bring these faces before millions. Today, that will happen again. The movie October Baby is a fabulous, moving, powerful encounter with the reality of abortion survivors, and the pain and healing they experience. It is the story of a beautiful young woman who, on finding out she was adopted after her biological mother’s attempt to abort her failed, goes on a journey in search of that mother. In the process, she journeys just as much into her own soul, to find the grace to do what she doesn’t think she has the power to do. Research has uncovered the wounds of those who have abortions, as well as the wounds abortion inflicts on marriages and families. Among the most fascinating research, still not as widely known as it should be, is that on abortion survivors. October Baby makes use of some of this research, done primarily by my friend and colleague Dr. Philip Ney, Canadian psychiatrist. Dr. Ney identifies ten different categories of “abortion survivors,” one of which, as with the central character of October Baby, is the survivor who is actually a victim of the abortion procedure but is not killed by it. But that doesn’t mean that something doesn’t die. Abortion survivors feel guilty and anxious about living, confused about their identity, and unsure of their psychological footing in a world where love, parenthood, and even God seem to have betrayed them. These dynamics take on another dimension when the survivor, as in October Baby, is a twin survivor, and lives with the knowledge that her companion in the womb was killed in an attempt that was aimed also at her. To love, educate, and serve our youth, we need to understand abortion survivors better. October Baby is an important step toward that goal, and Priests for Life is proud to co-sponsor its promotion. Don’t miss it! I had the pleasure of watching this movie and found it moving and noted that at the end there was applause. 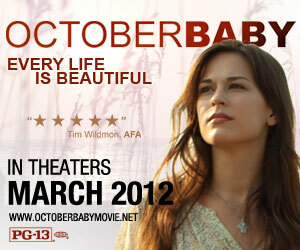 I found it to be a positive portrayal of an abortion survivor and what her family has to go through. I recommend this movie to anyone who has kids- or to give as a gift to anyone who has children! The teens who went loved it and initiated the applause! Bring your teens!